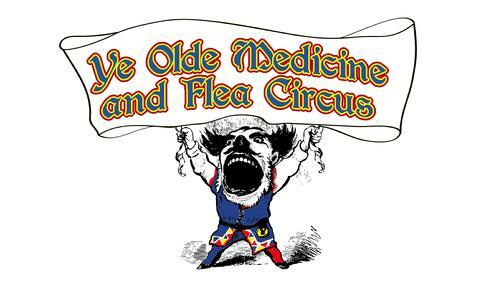 The venerable Flea Circus has a long and honorable history. O.K., maybe not "honorable", but it HAS been around a good long time. 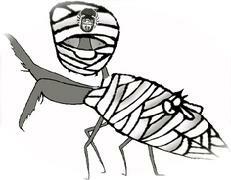 Lon Chanflea as "Mummy Bug"
Altho most people associate it with the late 19th century, it actually traces it's roots back to 'vermin shows' in ancient Egypt. Here is a well-known Hieroglyph, found on the side of a tomb of some nobody by the name of Tutkankhamun in the Valley of the Kings by Howard Carter himself in 1929! It wasn't until I spent EXHAUSTIVE time and research before I discovered that it was actually the FIRST RECORDED PLAYBILL IN HISTORY! Further research showed that it was an advertisement of that XVII Dynasty smash play, "Curse of the Mummy Bug" featuring Egypt's greatest actor of the time, Lon Chanflea, Jr! O.K., I made that last part up. But the Egyptians WERE using different bugs as entertainment! As far as more 'modern' take on things, the clockmaker Mark Scaliot in 1578 demonstrates a flea that he has locked in a devise made of 11 different pieces of metal, with a key! Further, he attaches it to a chain, which the flea proceeds to drag across the table! Queen Elizabeth I holding possibly Fleasus Bacon himself! In this photo we see Her Highness holding a flea in her hand. Again, careful research has led us to believe that this is the famous flea performer (and close, CLOOOOSE personal friend of the good Queen, but far be it from us to start scandalous rumor and inuendo) Fleasus Bacon! O.K, O.K...Maybe I fudged just a wee bit with what I said on the right. The part on the left of the picture, however, is documentable history. Preparing the "walk of DEATH"
preparing to walk across a 4-inch FLAMING BEAM! Johnny's the one with the bald head wearing the brown velour tights. We caution all unmarried 20 year old women to stay at LEAST 25 feet away. He's a CHICK MAGNET! 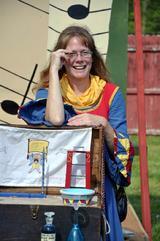 Johnny Fleanix, our 'Danger' flea! On the left, the beautiful Louisa, our high-dive flea wearing her lime-green bathing suit, designed by none other than Fleara Wang! On the right, Nathan. (He's a teenager,so sometimes we have to get a little bit strict with him). 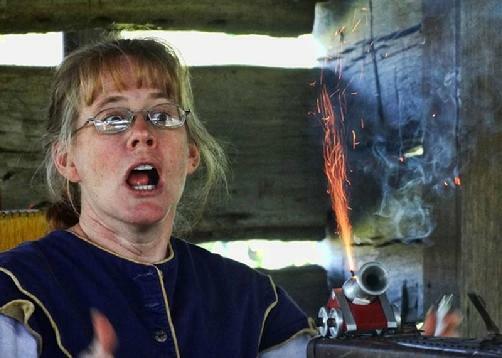 Firing the Flea Canon with Penelope, the Professor, and Nathan, the Daredevil Flea! We've both been to COLLEGE! And to think...She hasn't even READ this page yet! FLEAS! They're not just for carrying plague and disease anymore!